MINDZPEAK: Chance or Choice... ??? Just the other day I was talking to my five year old nephew on the phone as he was busy describing to me, his new adventures in school. Having heard enough, I tried to change the topic of the conversation. “What did you have for lunch today?” I asked. “Pasta… ? ?” I checked again. “Pastaaa… Faastaa… Fast thaaa…” I was on fast… he clarified in his kiddy voice. On further enquiry I came to know that the poor kid was fasting due to the ongoing ‘Navratras’ (nine days of the Goddess). To say that I was exasperated on hearing this would be an understatement. I mean, here was a little kid of five, who jumps for joy at the mere sight of the ‘M’ of McDonalds. To have him kept hungry for a whole day just to please the Goddess is laying it on a bit thick. Okay… there are people who are very religious and hopefully they understand whatever logic they seem to follow by observing rituals. But what sense does a five year old kid have about religion, rituals and anything of that sort ? Or are the ‘sensible’ adults promoting their religious devotion by forcing rituals on little kids ? All humans who follow a certain religion, do so because they happen to be born into that religion (except those who convert). So automatically, they learn (are taught) that their faith is the only true faith. This learning eventually turns into belief which quite often results in fanaticism. 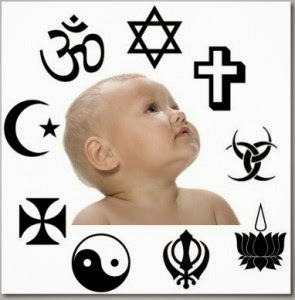 We identify a child by her or his religion right from the time of birth. But no one cares to ascertain which religion does the child wants to follow. Obviously, a new born cannot even decide upon the bladder/bowel functions, let alone be able to choose his religion. Right from the time of birth up to an age of maturity (which is taken to be as 18), it is obvious that a person cannot judge the pros and cons of a religion. Hence, a person below the age of 18 is unable to make independent choices. So, I wonder that why should any person below the age of 18 years (or before attaining mental maturity) be known to be following a certain religion ? Once he or she attains maturity, a person should be free to choose from the available set of religions as per their own logic. In other words, people below 18 years of age should NOT have any religion to follow. Unless a person is mature and aware enough to make choices, how can he or she know that his own religion is the best ? Abolishing religious identity of all people below the age of maturity would help to prevent religious fundamentalism and fanaticism to a certain extent. Hence, a person should have a choice to choose his religion instead of being forced into following one by mere chance by birth. I hope such a day becomes a reality in the future when people are able to choose their religion. 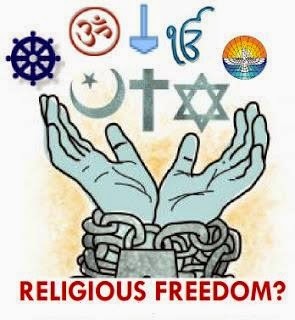 Though I guess people will hardly bother to think about religion, let alone choose one for themselves if they grow into sensible adults without being forced into following a religion by birth. Even my cousin was made to fast even though she was hardly 5 or 6 and I felt it was stupid. Why should a kid fast when it does not even understand why it is fasting?! Exactly ! And that is how seeds of religious fanaticism are sowed which create a lot of nuisance when such a kid grows up. Yes Alka Ma'am. The problem is that those who wont allow are the ones who were themselves forced into their religion by birth. This will continue until the cycle is broken at some point.